BYO Bow to the ISE! Four years ago I was browsing the ISE Show website and was checking out all the seminars and events that were to take place at our home ISE Show in Sacramento. 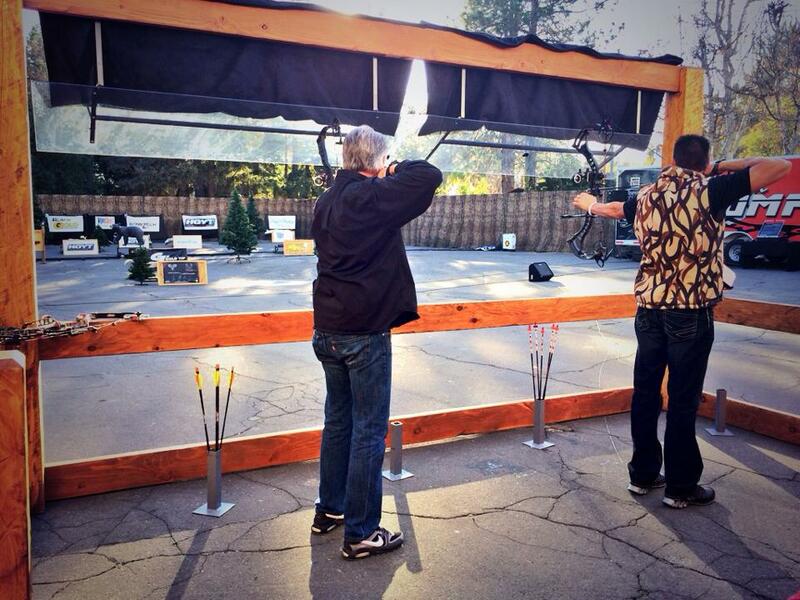 One event in particular caught my attention, a 3-D Archery Shoot right outside the building!?! Sounded pretty entertaining, but there really wasn’t a ton of info on how the whole thing worked, so I made a mental note to check it out once we got down to the show. In the back of mind, I did think it would be a fun event to participate in and I was half tempted to just give it a whirl (packed my bow in the trailer with our booth, just in case). However, I am one of those people that really need to have a fairly good idea of what I am getting myself into before I get myself into it. I had been to a few 3-D archery shoots but I had never really heard of a traveling pop up shoot, so I had a ton of questions and honestly would never have jumped right into it had I not been an exhibitor and able to check it out for the first two days of the show until I built up enough guts to just try it! 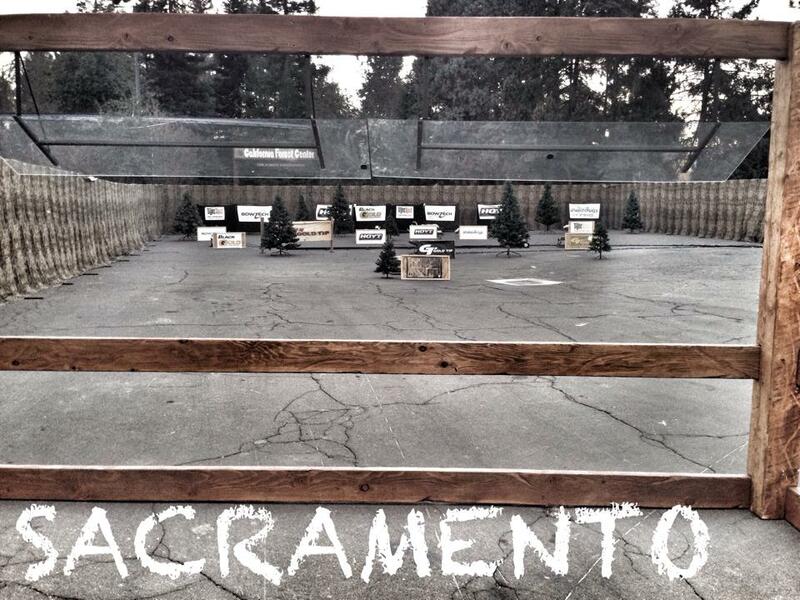 The range is set up right outside the hunting pavilion. You can actually see it from the main ramp as you walk into Cal Expo. It is typically set up as like a woodland scene with fake trees and all and there are a handful of targets set up on pop up like brackets. The targets are all high quality 3-D foam targets ranging from javelinas to mule deer to standing grizzlies. The targets are all set to a randomized mechanical timed system so every round the targets pop up in a different order. It is an unmarked shoot so yardage is to be guesstimated by the shooter. No range finders are allowed. But I think the farthest target out is about 45-50 yards and some as close as 15. The range is completely safe and set up inside a standing wall of plywood and all targets are backed with pads as well. Shooters shoot in groups of as many as five and all stand side by side in a defined shooters area. This is a bring your own bow thing and it is mostly geared for a hunting set up. But all kinds of bows are welcome, they just don’t want any of you buff guys shooting more than a 70# Draw Weight. The plywood just can’t stop those arrows 😉 Every Shooter is allowed to shoot five arrows per round. No other arrows can be brought up to the shooting area. Quivers cannot hold extra arrows. Five is all you get and a little arrow stand is provided. Each round you will shoot five arrows, one per target, so that means five different targets will pop up or run by from five different areas of the range. Occasionally some trick targets pop up that are not scored, like a doe in front of a buck, or a jackalope, hahaha. Those are dummy targets and they are not scored so don’t waste an arrow on those. Once you get your practice rounds out of the way, its time to qualify. Qualification rounds rank shooters by score (120 possible) into 1 of 32 possible seats on the tournament board. You can always re-qualify up to a certain time before the shoot off starts on Saturday afternoon around 2pm. So you have all day Thursday and Friday to practice and or qualify. Or come early and do it all Saturday morning. Now the way the whole bracket board is set up after the 32 slots are filled, is kind of confusing to explain, but the nice part I like to mention is that is that it is set up on a handicap system very similar to a golf or bowling tournament. So those shooters scoring super high during qualifying rounds are not necessarily set up to beat out the ones with a tad lower qualifying score. You can check out this You Tube Video that explains the handicap scoring system more in depth than I can by clicking below. $35 gets you 2 practice rounds and a qualifying round. You can buy additional rounds as needed too. If you do happen to qualify for one of the 32 seats on the board, you are eligible to win some great prizes as you advance up the ranks. I am pretty sure the shoot out pays through 3rd place and pretty decent money too! Women’s Division pays well too, so I for sure encourage the ladies to come out and shoot this as well! And don’t worry for all those who shoot the tourney and end up so close they can taste the winnings, they can come back on Sunday and shoot for some cool prizes in the prize only shoot. 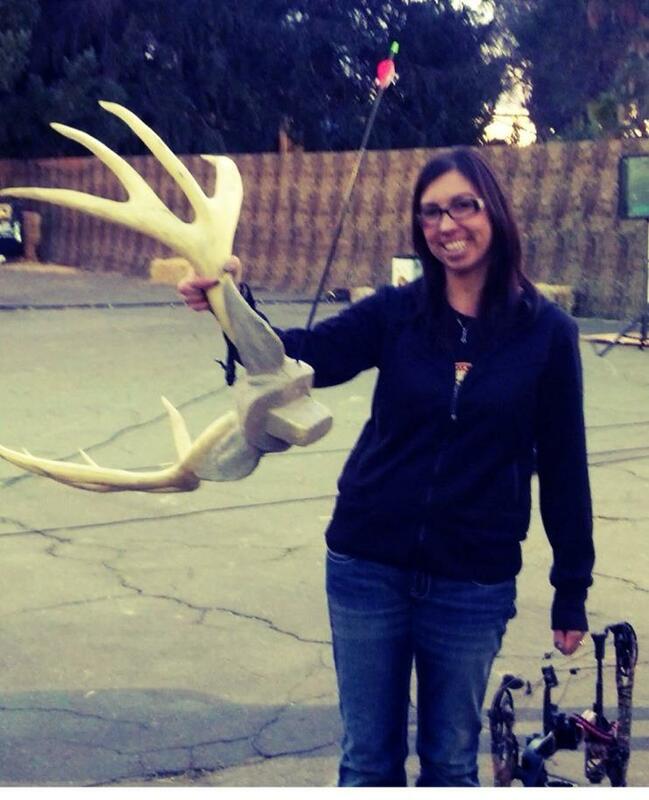 Bring your case so you can set your bow down in the shooters area safely. Sometime the lines get long. Bring extra arrows and some extra field tips too. You can also bring some binos so you can see the range from afar as well. I like to first shoot on Thursday and get a feel for it. So if you can come to the show multiple days, I would definitely do it. Saturday gets a little too crazy to get practice rounds in before the shoot off starts. 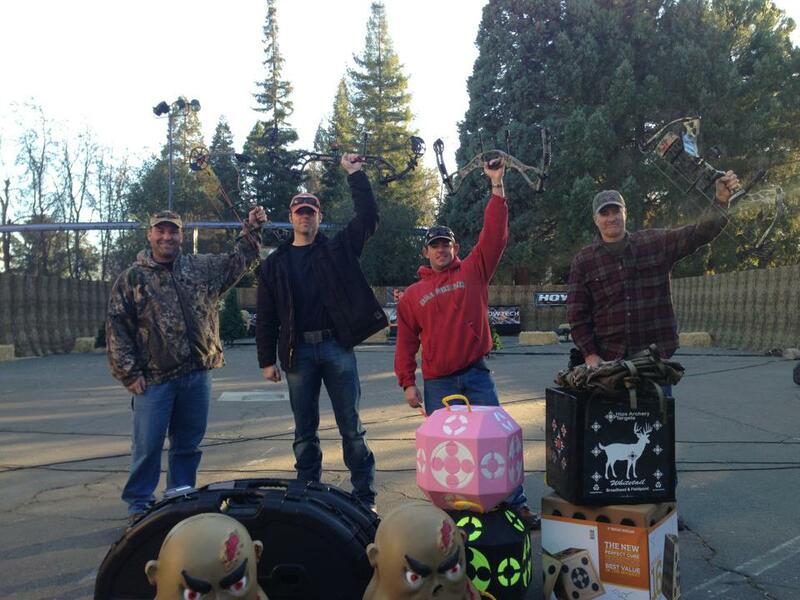 And just so you all know, the tour changed hands back in 2014 and now High Impact Archery runs the show! It is still just as fun and well organized if not better so I would encourage anyone who enjoys archery to come check this event out. If you have specific questions, feel free to as me and if I can’t answer them, hit up the team at High Impact Archery and I know they can! It really is a great event that I look forward to every year!!! Heck, I even know a guy who travels to every ISE Show just to shoot in this Pop-Up Challenge! Super fun stuff! Get your bow out and come shoot with me January 21-24th and check out all the awesome things ISE has to offer! Plus Ill be doing a seminar both Saturday and Sunday you will not want to miss! *Photo credit goes to the Humphries Archery Crew. I borrowed most of them from their Facebook Page;) Be sure to give their Facebook Page a Like as little token of my appreciation!